This was another sketch done quickly when out cycling last weekend. I dropped off the road onto the canal pathway, trying to find a good view of the evening light filtering through low fast moving clouds. This scene was on the other side of the water. As the composition evolved, I had left no room to show the reflections which extended to my feet. Here are two views, the first as completed outside. I have put quite heavy tones into the sky then worked over this with white crayon. The marks extended unevenly onto the trees giving more definition to those darkly drawn shapes. 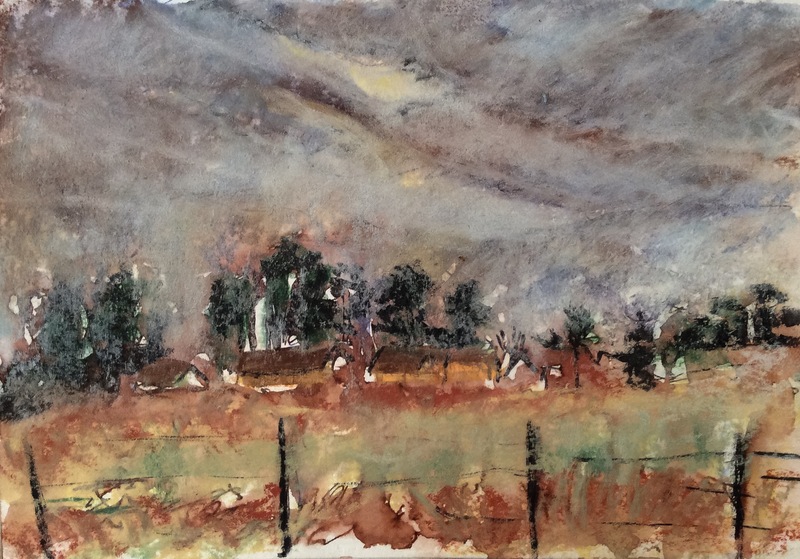 At home, I painted back over the sky with white gouache, then sanded this back and scraped back over it with crayon, aiming for more subtle variations of tone and light. I also worked in pen and crayon to give more definition to the houses and foreground field. This week the weather has alternated between overcast and bright cold sunshine. The urban environment through which I drive to work is near the outskirts of the city and built on undulating land, largely shaped in the Ice Age and gently eroded by small brooks. I notice as I turn into certain roads I look across roof tops to a sky line built in layers of trees and buildings. In the early morning these catch the sun and glow. I parked up on the way to work at the top of a descending road and tried to capture the sunshine picking out distant residential blocks on the far wooded ridge, partly obscured by near trees and roofs. The proportions are wrong – the blocks should be smaller to show their distance. On a different day, yesterday in fact, I parked at work facing across the railway line to the Muirhead Tower, with the visor down to reduce the sun’s glare. Before getting out, I drew the tower and adjacent building, partly obscured by a line of bare trees. Both sketches were drawn, rather too intensely, with fountain pen and then overlaid with conte crayon. I have worked back over them to lighten the sky with white gouache which picks up the underlying pigments. At Marsh Lane Nature Reserve, on a whim, I recycled an old pencil sketch of Aston Brewery (made on the same day as this more complete drawing). The vertical ribs of the tanks became reflections in the water of and the shading of their lids became low clouds. 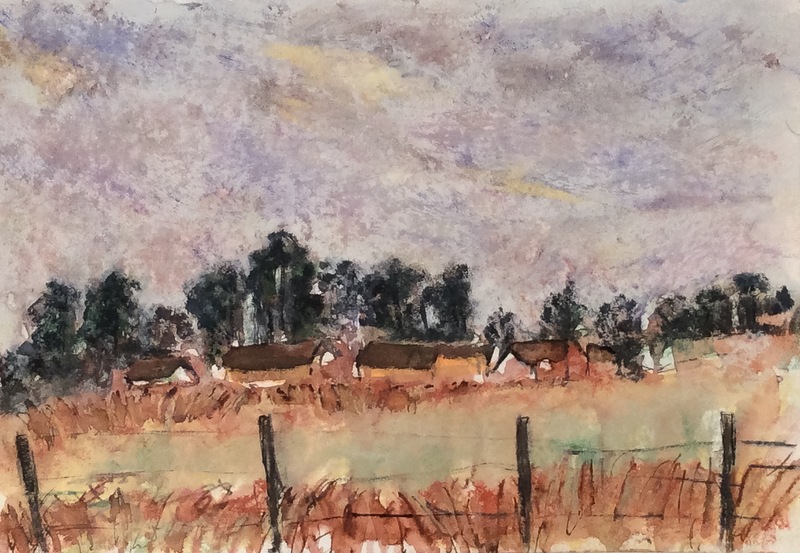 This sketch was made in a widening palette of fountain pen ink, black, blue, red and brown, liberated with water and overlaid in places with conte crayon, gouache and watercolour. This sketch was done during an evening cycle one evening last weekend. The mill chase had flooded the road. I drew from the foot bridge. By accident I have captured the ripples of the flowing water in the foreground, perhaps by dragging the side of a crayon over wet ink on textured paper. This reminded me. Only a few miles from me is Sarehole Mill, known to Tolkien in childhood. The urban area in which I now live was once the rural inspiration for Hobbiton. Perhaps we are the invading orcs of his imagination. I must go to Sarehole Mill to draw one day. I was completely bemused when the model sat, primly dressed, staring at us, cradling in her arms a log. I had no idea of the reference. There was something hauntingly primitive about her, such that not just the log but the whole seated person was a totem, imbued by believers with supernatural power. I found myself exaggerating her hands, wherein the power seemed to lie. Here are a mix of sketches, as done on the day and touched up after. Here are 20 minute poses for Rose Thorne, Benjamin Louche and Suzy Sequin. Rose Thorne posed elegantly. I know very little of the owl in Twin Peaks. From Youtube I learn that a message is passed on, perhaps from an extragalactic source, that the Owls Are Not What They Seem. Mr Louche looped in, mask and megaphone in hand, declaiming from the Twin Peaks sound track. I tried to capture him on paper as I do with wildlife, tracking his movements then shutting my eyes for a moment to try to fix the image on my retina before drawing. As he stood stock still, the double bass sounded the rhythm, over which the refrain The Black Dog Runs at Night repeated, over and over. Benjamins Louche’s own wordpress blog is here. On the day I accessed it, the lead post was a haunting dream sequence with a grainy black and white photograph. Beneath this is a charcoal drawing of a face, animated to jerk slightly, in and out of focus. One aspect of his persona is as cabaret and burlesque host. It turns out he and Rose Thorne are married. Also he appears in Star Wars, the Force Awakens, but under heavy prosthetic make up. The last of these three images from Dr Sketchy’s is, I guess, classic burlesque. The model is Suzy Sequin, to whom my sketch did not do justice. I have known of Dr Sketchy’s for a year or so but this was my first time attending. This indie alternative art movement breaking the art class rules was founded in 2005 and has spread with branches in major cities world wide. Burlesque and cabaret seem common themes through the drawing events, less exposed flesh but more edgy than a life drawing class. On the day I went, the audience was of wide age range, and mixed gender and ethnicity. The combination of great models, drawing, entertainment and beer gets as close to fun as I can imagine. Now my wife, who doesn’t draw, wants to come. I have one last drawing to post from this session. The Lady with the Log. Laura Palmer is murdered. She is murdered before the pilot episode of Twin Peaks first showed in April 1990. She is found washed up on the river bank, wrapped in plastic. Her death brings in investigators and drives the plot of the first series. Nothing quite attracts television audiences so much as a young dead woman, her life unpicked publicly without her agency, seen through celluloid. At Dr Sketchy’s Twin Peaks drawing session in the upper room over a pub, Laura Palmer was played by the gloriously named Miss VJ Spankie. She entered through the audience, moving and occupying the whole stage, playing the Twin Peaks theme on the violin. She seemed in wedding weeds, until the eye adjusted and she was seen clothed in industrial plastic sheeting, bound round and round her middle with blue string. She made no eye contact, seemed expressionless but dominated the room, posing for us to draw.